Well, today's finished object is ... appropriately named, lol. 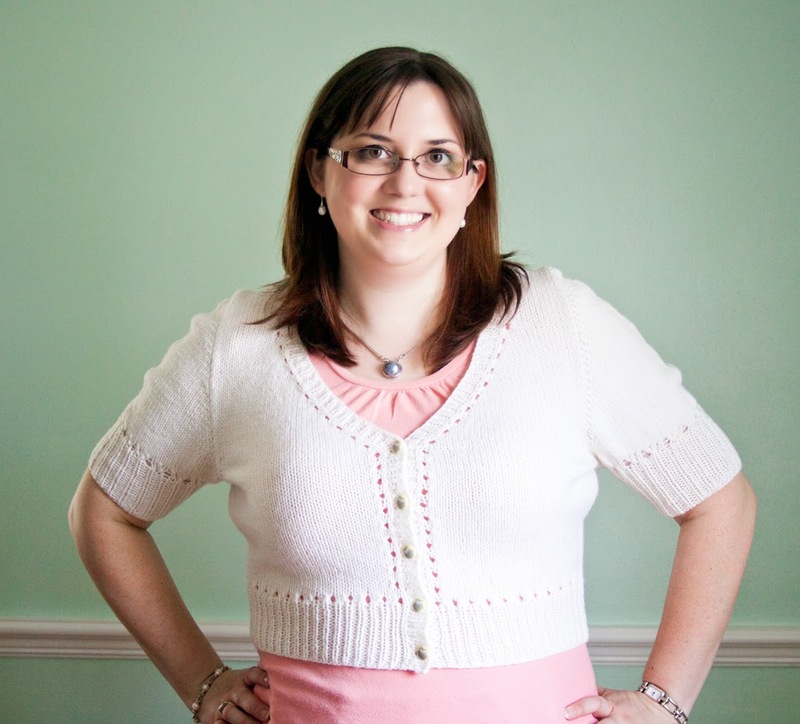 I was really excited about making the Myrna cardigan as soon as Andi posted it - it's cropped, short sleeved, and simple with just a basic detail in the eyelet design around the edges - perfect! Then she announced the Outfit Along and I was totally in. 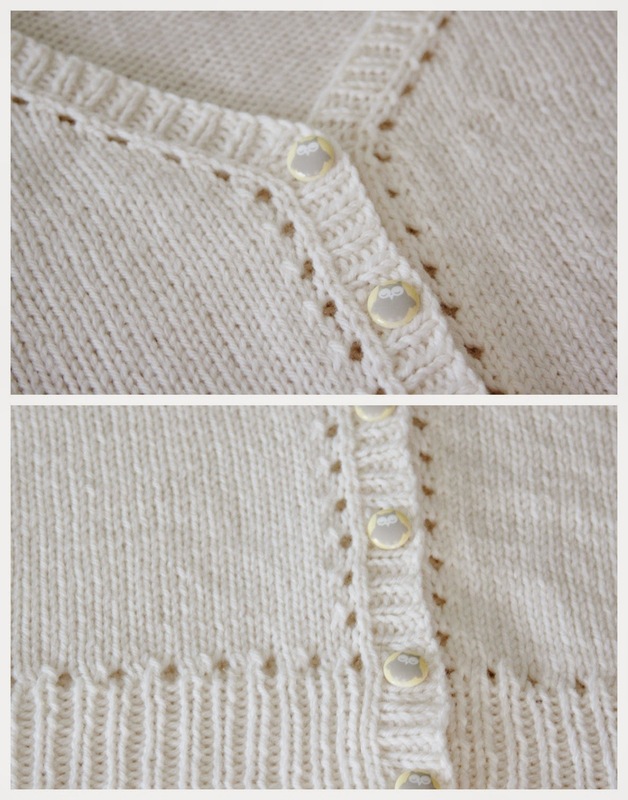 The idea was to make the Myrna cardigan and a dress to wear with it (an "outfit" - get it? ), I figured this would be simple enough and just the fire I needed to get things moving with my sewing ... Sadly, life and other disasters happened causing me to just face the fact that I would not get this challenge completed in time. Side view complete with post-blocking-crease :) I think my face sums that one up, lol. Back view - and yes I deliberately moved my hair out of the way to show the neck detail - just in case you thought my hair normally looked like that in the back, lol. *Oh and word to the wise on knitting a pale colored sweater when you have very dark hair - watch for stray hairs on your projects! I had to carefully pull out at least 3 or 4 long hairs that I accidentally knitted into the sweater with the yarn. I'm sure I've done this on accident with my other sweaters, but none of them have been light enough to notice the hairs. I never even thought about it before, but it was really obvious on this sweater. **Also, I ended up washing this in Eucalan about 4 times to get the "wet sheep smell" out. I had to be really careful not to accidentally felt the sweater, but the smell was really strong when the yarn got wet. I guess because it's more natural (a.k.a. undyed), its smell reflects that. Even with all the soapy rinses, my whole hallway still smelled like I just bathed the dog while this was blocking. I think this picture shows the creamy color a little better. I did block the daylights out of that waist to get it to my measurements (I am not nearly as hourglass shaped as it is written for), but this worked a treat and I think the fit is spot on now. Another issue I'm having is that this sucker is really freakin' hot to wear. I mean, I know it's wool and all, but I've always read that wool "keeps you warm in winter and cool in summer." What a load of malarkey that is. I live in Florida, people! The people I've heard this misinformation from clearly don't know what summer is truly capable of heat-wise. I was sweating wearing this sweater even while I was taking these pictures in my air conditioned house. I was hoping this would end up as a nice cover up for my sleeveless tops and dresses in the summer, but this is most definitely a winter-wear-only item. So, that's one more strike for it. I had planned on using ribbon to stabilize the button bands, but I didn't have any on hand in cream - plus I don't know what color I want this to eventually be - plus I was so ready to just be finished with this. I did slap some super cutesy buttons on it though. They have cartoon owls on them! Do I realize these buttons are designed for toddler clothing? Absolutely. Ask me how much I care :) They are my one little touch of fun on this sweater, so they stay. Ugh, my bangs. I was actually sweating while taking these photos - thus the hair troubles. So, all in all this sweater was quite the learning experience for me. I definitely plan to use this pattern again in the future, but maybe with a nice cotton yarn, lol, and in ACTUAL WHITE. I find myself constantly wishing I could wear my hand knits more often, and I'm learning the criteria that will work out that way as I go. I will certainly wear this in the winter, but it will sit unloved in my "box of sweaters I can't wear right now" for at least 3 or 4 more months. Ah, Florida - how I hate your weather. At least I am able to learn from my mistakes, right?! Here's hoping my next Myrna isn's so "meh".